This first and only tour of its kind is the best experience Little Havana has to offer! The Little Havana Paint, Taste & Sip Tour provides a unique interactive "edu-tainment" experience that will stimulate all of your senses. Come walk, paint, taste and sip with your friends and new ones you'll make along the way! You'll meet up with your professional local tour guide at the Little Havana Welcome Center and will be led on a 60-minute walking tour that will immerse you in the rich culture and heritage of this vibrant Miami neighborhood. Along the walking tour, you will be able to taste the authentic flavors of Cuban cuisine and beverages such as empanadas, pastelitos and Cuban coffee. The walking tour will culminate at Futurama Art Galleries where you'll participate in an Artist Chat and learn how to make your own Mojito Cocktail that you'll sip while painting your own Little Havana inspired masterpiece of the iconic Rooster sculpture or a Little Havana mural. The experience doesn't stop here. 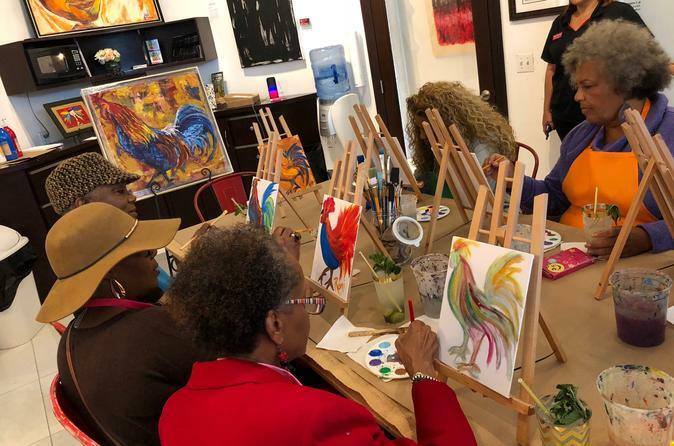 After painting your personal Rooster souvenir, you will participate in a gourmet chocolate demonstration & tasting and learn a few Salsa dance moves. Now, doesn't this sound like a unique, fun and memorable experience to have in Little Havana? Well, go ahead and book your spot today. Space is limited up to 12 people per tour to ensure an intimate, memorable experience.